The Gender Affirmative Model: A New Approach to Supporting Gender Non-Conforming and Transgender Children, Colt Meier, Ph.D. & Diane Ehrensaft, Ph.D.(eds. ), American Psychological Association Publications, in process. Ehrensaft, D. “It Takes a Gender Creative Parent” in A. Lev & A. Gottlieb (eds. ), Families in Transiton: Parent Perspective in Raising the Gender Nonconforming or Trans Child (in press). Ehrensaft, D. “Baby Making: It Takes an Egg and Sperm and a Rainbow of Genders” in Katie Gentile (ed. ), The Business of Being Made: Producing Liminal Temporalities through ARTS, New York: Routledge, 2016. Ehrensaft, D. Found in transition: Our Littlest transgender people. Contemporary Psychoanalysis, 50:4: 571-592, 2014. Psychological and medical care of gender nonconforming youth. Vance S, Ehrensaft D, Rosenthal S. M. Pediatrics, 2014. Gender Nonconforming/Gender Expansive and Transgender Children and Teens. Sherer I., Baum J., Ehrensaft D., Rosenthal S.M., Contemp Pediatrics, 2014. Child and Adolescent Gender Center: A multidisciplinary collaboration to improve the lives of gender nonconforming children and teens. Sherer I, Rosenthal SM, Ehrensaft D., Baum J., Pediatr Rev 33:273-275, 2012. Ehrensaft, D. “Listening and Learning from gender-nonconforming children. The Psychoanalytic Study of the Child, Vol. 68, 28-56, 2014 . Ehrensaft, D. “Family complexes and Oedipal circles: mothers, fathers, babies, donors, and surrogates. In M. Mann (ed.) Psychoanalytic Aspects of Assisted Reproductive Technology. London: Karnac, 2014. Ehrensaft, D. “From gender identity disorder to gender identity creativity: The liberation of gender-nonconforming children and youth.” In E.J. Meyer and A.P. Sansfacon (eds. ), Supporting Transgender and Gender Creative Youth New York: Peter Lang, 2014. Ehrensaft, D.“A terrible Thing happened on the way to becoming a girl: transgender trauma, parental loss, and recovery.” In P. Cohen, M. Sossin, & R. Ruth (eds. ), Healing after Parent Loss in Childhood and Adolescence. Lanham: Rowman & Littlefield, 2014. Ehrensaft, D.“The Gender affirmative model: what we know and what we aim to learn.” Hidalgo, M.A., Ehrensaft, D. Tishelman, A.C., Clark, L.F., Garofalo, R., Rosenthal, S.M., Spack, N.P., & Olson, J., Human Development, 56: 285-290, 2013. “Look, Mom, I’m a boy—don’t tell anyone I was a girl.” Journal of LGBT Youth, 10:928, 2013. Ehrensaft, D. “The ‘Birth Other’ in Assisted Reproductive Technology” In M. O’Reilly-Landry (ed. ), A Psychodynamic Understanding of Modern Medicine. London: Radcliffe, 2012. 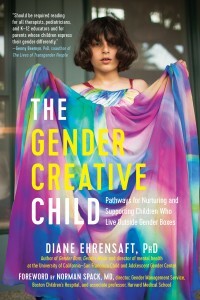 Ehrensaft, D. “From gender Identity disorder to gender identity creativity: True gender self child therapy. Journal of Homosexuality, 59:3, 337-356, 2012. Ehrensaft, D. (2011). Boys will be girls, girls will be Boys: Children Affect Parents as Parents Affect Children in Gender Nonconformity.Psychoanalytic Psychology. Ehrensaft, D. (2010). I’m a Prius: A Child Case of a Gender/Ethnic Hybrid. Journal of Gay and Lesbian Mental Health, 15(1): 46-57. Ehrensaft, D. (2009). One pill makes you boy, one pill makes you girl. International Journal of Applied Psychoanalytic Studies,6(1): 12–24. Ehrensaft, D. (2008). A Child is Being Eaten: Failure, Fear, Fantasy, and Repair in the Lives of Foster Children.” Journal of Infant, Child, and Adolescent Psychotherapy, 7:2, 100-108. Ehrensaft, D. (2008). When Baby Makes Three or Four or More. In The Psychoanalytic Study of the Child, Vol. 63, New Haven: Yale University Press. Ehrensaft, D. (2008). Just Molly and Me, and “Donor Makes Three. Journal of Lesbian Studies, 12: 2-3, 161-178, 2008. Ehrensaft, D. (2007). Raising Girlyboys: A Parent’s Perspective.” Studies in Gender and Sexuality, 8(3), 269-302, 2007. Ehrensaft, D. (2007). The Stork Didn’t Bring Me, I Came From a Dish: Psychological Experiences of Children Conceived through Assisted Reproductive Technology. Journal of Infant, Child, and Adolescent Psychotherapy, 6(2): 124-140.